Bullets coming from the North once again had people on the South Korean controlled island of Yeonpyeong hiding in shelters. Tensions are at maximum level. The Korea Express ferry to where war seems imminent is white and unremarkable. On board, a map has a red star added right near Yeonpyeong Island. 'Location of artillery attack' written next to it. It's exactly where this ferry is headed. The hills of North Korea first become visible after two hours of sailing from Incheon, across the Yellow Sea. They're only a few kilometers removed from tiny Yeonpyeong Island. The South Korean mainland has long disappeared from sight. Ferry staff is about to dock the ship to the jetty, when the captain shouts from the bridge: "Everyone inside! We are not staying! We are turning back immediately. We've heard more shots. It is not safe here!" Sirens sound on the island itself. People in the fishing village are seen running to shelters. Most of them are members of South Korea's military. The 1400 people who normally live here were evacuated to the mainland four days ago, when North Korea fired 180 projectiles towards the island. Four people -two civilians, two military- died. South Korean marines in speedboats circle frantically around the island. Further away, larger marine vessels can be seen patrolling the maritime border which the United Nations set in 1953 between North and South. The North, however, doesn't recognize it. New shots being fired can be heard at regular intervals, coming from the hills on the horizon. North Korea is sending a message that it means business - and as far as today goes not in a good way. Twenty minutes pass. Then, the captain of the ferry gets permission to quickly dock at the jetty after all. It's a necessity, because the ship is filled with provisions badly needed on the island. And big bags of dog food. The pets on the island had to fend for themselves, ever since their owners were forced to leave. Members of the South's Special Sea Attack Forces carry the bags on land. A tiny dachshund sniffs them out. Other than this, Yeonpyeong is dead. The rubble of the homes hit by the North's artillery hasn't been touched. Fishing vessels have been pulled on land and remain unused. On each piece of rock that pierces slightly into the sea, a soldier stands guard. Time is running out. The ferry has to leave as soon as possible. The tension is clearly present on the faces of the soldiers. They shout at each other as they lift boxes on land. The captain uses his megaphone to bark 'FASTER!' at whoever catches his eye. He has only one thing on his mind: To get. Out. Of. Here. It's the first time since the North's attack the ferry has been allowed to sail to Yeonpyeong. Upon return to Incheon on the mainland, it turns out to have been the last as well, at least for a while. The authorities have declared the island off limits again, it being too dangerous for anyone but the military. Only hours after that decision, the North sent rocket launch platforms out to sea. To the south, a US aircraft carrier joined the South Korean navy to engage in a show of force drill. The North has deemed this a further provocation which, it says, will bring the Korean peninsula to the brink of war. That brink is very visible on Yeonpyeong, but also present in the South's capital Seoul. There, veterans protested all weekend long in front of the Ministry of Defense. They demand revenge for the two servicemen who were killed by the North's artillery. They burned North Korean flags and photos of its leader Kim Jong-il. 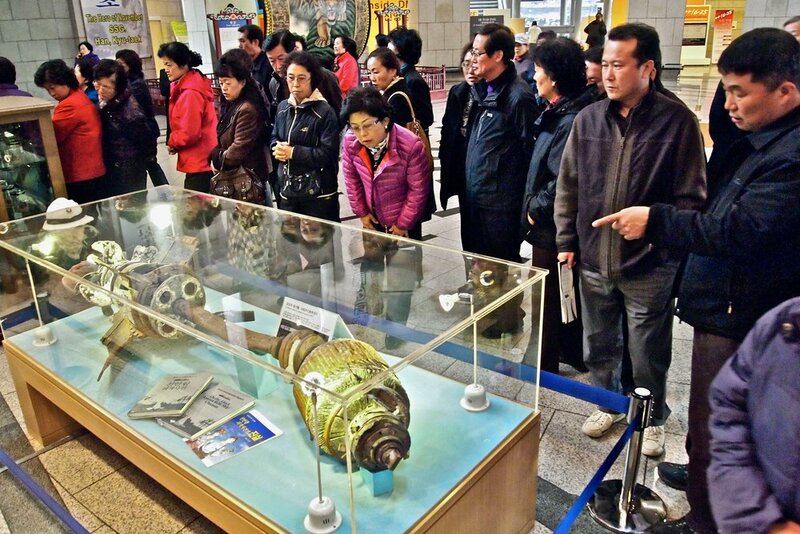 At first, the people of Seoul seemed unfazed by the North's shooting of Yeonpyeong. They're used to the threat from Pyongyang. It's always there, so why worry more now? Light blue cabinets with gas masks are located in every metro station. For when the bomb drops. Nobody thinks that's odd. But this time, the people seem to realize this crisis might last a bit longer. The South Korean government speaks tough language. The new minister of Defense, Kim Kwan-Jin, promised a 'thousandfold retribution' for the death of his two soldiers. So far it's only words. However, it took Seoul only thirty minutes to decline an invitation from China to come over to Beijing and talk with representatives from the North to find a way out of this latest crisis. "Now is not the time for talk," according to a spokesperson for the South's president Lee Myung-bak.